Good news and bad news time, guys. Traditionally I like bad news first, and the bad news is that we probably won't see Moon in the Week In Review for awhile - she's in the process of packing up her life and quite literally shipping up to Boston. She's gonna concentrate on that transition for a bit, and then no doubt be back and better than ever with wonderful new running routes to tell us all about! I know - you're all sooooo surprised. At least I pulled the proverbial trigger a lot quicker this year! Although I flirted with Goofy, I'm just doing the marathon again - more on that decision process at a later date. I'll probably do another quick-turnaround weekend a la last time. 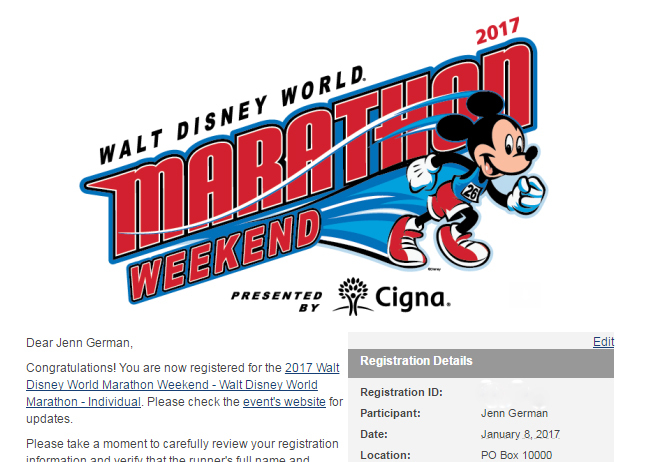 The 2016 WDW Marathon was one of my favorite races ever, and I'm already looking forward to 2017! Who else will be there?! And on that more positive note, I give you: the roundup. - Pink Elephant on Parade wonders if we shouldn't think a little less about the finish line and a little more about not dying. - Back At Square Zero does some big city racing. - ImagiNERDing adds to your Disney reading list. - Rolling with the Magic rounds up the best WDW bars. - The Main Street Gazette highlights the beauty of Disney's Animal Kingdom. - The Disney Tourist Blog has the latest on WDW's summer updates. - The Disney Hipsters share the vegetarian wonders the Disney Cruise Line has to offer. - The Disney Nerds eat in Tokyo Disneyland. Congrats on Disney! Thanks for including me.